Heat oven to 375°F. In medium bowl, stir cookie mix, flour, butter and egg until soft dough forms. On floured surface, roll dough 1/8 inch thick. Cut 12 rounds with 2-inch round cutter and 12 rounds with 1 1/2-inch round cutter. Cut moustache shapes by cutting slight S-shape down center of each 1 1/2-inch round with knife. On ungreased cookie sheets, place cookies 1 inch apart. Bake 7 to 9 minutes or until edges are light golden brown. Cool 1 minute; remove from cookie sheets to cooling rack. Cool completely, about 15 minutes. Meanwhile, in small bowl, stir frosting, cinnamon, red pepper and nutmeg until blended. 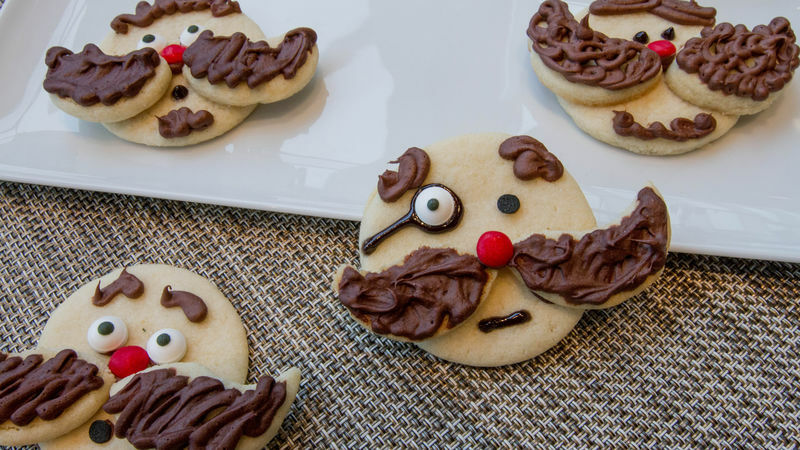 Use frosting to attach 2 S-shaped halves next to one another on each 2-inch cookie round to make moustache on face. Pipe or spread frosting on each moustache to decorate. Use gel, candies and frosting to make eyes, nose, mouth and cheeks on each. Use round cherry candies for the signature red nose and eyeball candies for the eyes. Use decorating gel for glasses, mouths and even eyebrows!